Rear living room floor plans place the living room at the back of the RV. This is a very popular layout for many reasons, including a large living room with excellent views of the great outdoors. Love the view from the back window of your RV? If so, the rear living room floor plan may be the best for you. With the living room in the rear of your RV, you can enjoy the view from the large back and side windows. Many rear living floor plans have two recliners or a sofa, perfect for relaxing and enjoying the company of friends and family. Many rear living room floor plans feature a central kitchen with lots of space. Floor plans with rear living rooms also offer a variety of bathroom and bedroom layouts to choose from. 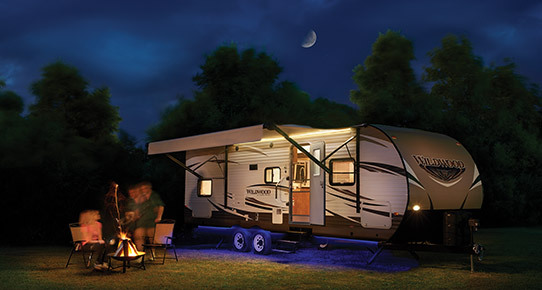 Several RV floor plans place the living room in the rear, including travel trailers, 5th wheels, and destination RVs. 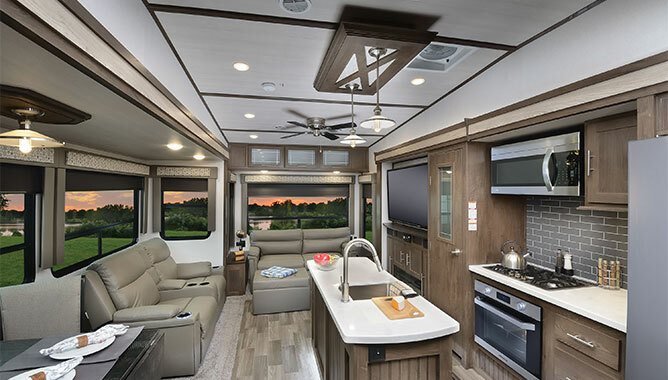 Shop our online selection of RVs with rear living room floor plans at your convenience or visit our dealership to see your favorite models in person.